Wreaths, originally uploaded by bill kralovec. 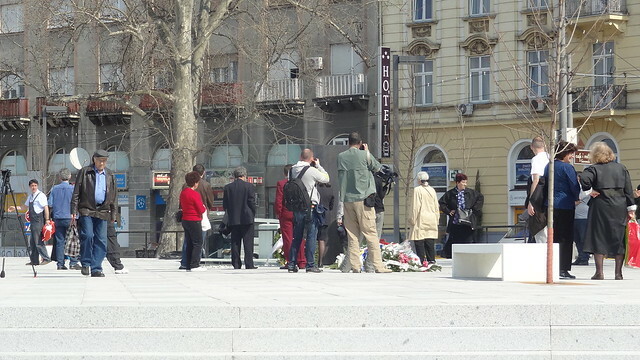 This morning I stopped by and saw the new monument that opened today in Belgrade. It is remembering the people who died during the Yugoslavian Civil Wars of the 1990’s. 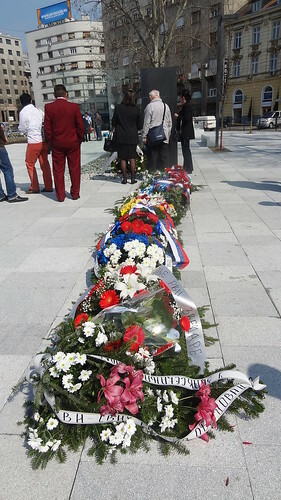 It honors not only civilian victims, but the Serbian soldiers as well. It is located on a new Sava Square that is located very close to the train station in downtown Belgrade. Today marks the 13th anniversary of the start of the NATO bombings in 1999. The monument is controversial in that the victims names are not listed and some people feel that the Serbian government needs to recognize more, the crimes committed during the wars. There were lots of people taking photos and laying wreaths. A very sad monument. It is sad that people died and their surviving loved ones still miss them today, and as well the horror of war. It is a small and difficult-to-read inscription on the metal wall. I liked the white stones for the base and the little pool, mimicking the Washington Monument in D.C. The anniversary was subdued today. There was no moment of silence or sounding of the air raid sirens, as in previous years I’ve been in Belgrade on this date.